Today’s healthcare leaders are facing challenges unlike ever before. New healthcare laws, reimbursement models and regulations unnerve even the most senior of leaders resulting in increasingly shorter tenures of those in leadership positions. The modern healthcare leader needs to be increasingly resilient but all relevant to their organizations and the industry. 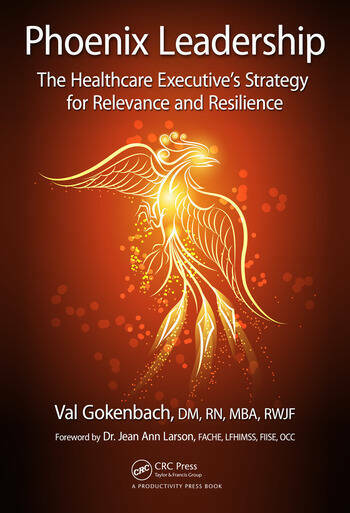 This book introduces a brand-new paradigm created by Val Gokenbach for leadership in complex organizations and provides effective strategies that will guide leaders in the healthcare field. Val possesses a doctoral degree in Management and organizational leadership and has been a healthcare executive for over 40 years. She is also a leadership consultant, professor, executive coach and author on leadership topics. You, as a healthcare leader, will learn to reinvent yourself by putting her proven concepts into effect to become a Phoenix in your organization. Chapter 2: What is a Phoenix Leader? Val Gokenbach, DM, RN, MBA has a true passion for leadership and has been in administrative healthcare positions for over thirty years. She currently is the owner of Dr. Val Leading Leaders Consulting Group dedicated to improving the quality of leadership in healthcare organizations. As a senior executive she has managed an expansive span of responsibility, which included Nursing and several support departments such as radiology, respiratory therapy, radiation oncology, nuclear medicine, oncology services, neurodiagnostic services, employee health, integrative medicine, schools of allied health, patient service departments and the emergency services. Her greatest accomplishment has been leading the nursing team to the receipt of the prestigious Magnet accreditation awarded on January 14, 2004 for nursing and organizational excellence and re-accreditation in 2008. As a professional dancer and fitness instructor for over 40 years, Val has led a dual life as a fitness presenter, consultant and dance instructor. She worked for Aerobics Fitness Association and traveled extensively presenting health and wellness programs for fitness instructors and the general public. This exposure led her to the opportunity to work with companies such as Omron and Oregon Scientific as a spokesperson for health and wellness products and serve as a guest host on the popular QVC sales network and Shopping Channel in Ontario. She also developed a line of exercise videos called "You Can Do This" which were also sold on QVC. Val is also involved in several community initiatives and served as the creator of Safety City USA, the first free standing, non-profit interactive learning facility for the community, dedicated to the reduction in pediatric trauma and Nurses 4 Detroit a foundation for philanthropic nurses in the South East Michigan area. Currently she is an independent consultant in the areas of organizational structure and leadership growth and development and a Professor for American Sentinel University. She also serves as the Medical Administrator for Mitch Albom Charities where she runs the SAY Detroit Family Health Center dedicated to the care of the homeless and uninsured women and children and the Have Faith Mission, an orphanage in Haiti. In her past time she lectures on health and wellness topics and is active on several advisory and leadership boards throughout the community. A well-known author, she recently released her own wellness book Tap Dancing through Life: Seven Steps to find your rhythms and the life of your dreams, and is featured in Chicken Soup for the Nurse’s Soul: A Second Dose and Nurse Executive: The Four Principles of Management from Springer Publishing. She possesses a doctoral degree in management (DM) and organizational leadership, a masters degree in business administration (MBA) and a bachelor’s of science in nursing (BSN) and is a Robert Wood Johnson Executive Nurse Fellow, a Magnet Commissioner for ANCC and an alumnus for Leadership America.